Sensing in cognitive radio (CR) protects the primary user (PU) from bad interference. Therefore, it is assumed to be a requirement. However, sensing has two main challenges; first the CR is required to sense the PU under very low signal to noise ratios which will take longer sensing time, and second, some CR nodes may suffer from deep fading and shadowing effects. Cooperative spectrum sensing (CSS) is supposed to solve these challenges. However, CSS adds extra energy consumption due to CRs send the sensing result to the fusion center and receive the final decision from the fusion center. This is in addition to the sensing energy itself. Therefore, CSS may consume considerable energy out of the battery of the CR node. Therefore in this paper, we try to find jointly the sensing time required from each CR node and the number of CR nodes who should perform sensing such that the energy and energy efficiency (i.e., ratio of throughput to energy consumed) are optimized. 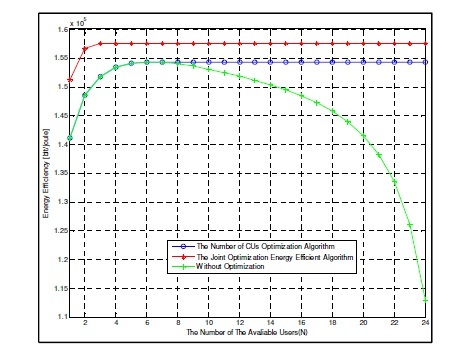 Simulation results show that the joint optimization achieves better in terms of energy efficiency than other approaches that perform separate optimization. reducing sensing time increases the room left for transmission which achieves the main target of CR of increasing wireless spectrum utilization. Moreover, sensing plays a crucial role in the success of the whole process, where the use of PU’s channel is under the constraint that the PU is protected. PU protection is achieved by sensing. For this reason, sensing has received a lot of attention in order to perform it efficiently. Sensing means detecting the existence of a primary transmitter on a specific channel. If the PU exists, then this channel cannot be used. Otherwise, the CRs are free to send on this channel. In primary transmitter detection, the CR is required to detect the existence of a primary transmitter inthe keep-out region. The keep-out region can be imagined as a circle centered at the PU, and with a radius equal to the sum of the transmission range of the CR plus the transmission range of the PU.Therefore, PU sensing is under the challenge of detecting very weak signal with SNR typically down to -20 db. Another challenge for spectrum sensing is that it suffers from problems of multipath fading and shadowing which may decrease the detection performance. Therefore, cooperation is proposed in literature as a promising solution to these problems. It increases the probability of detection and decreases the probability of false alarm . In CSS, there is a fusion center that collects the sensing results from different cognitive users and makes a decision about the presence or absence of a primary user. Even though sensing in CR is one of the most studied areas in CR, research was focusing on either protecting the PU or reducing the sensing time such that the room left for transmission increases.In this paper, we consider sensing from another point of view which is reducing the consumed energy or increasing energy efficiency. Energy is consumed during sensing in three stages: 1) sensing stage itself consumes energy, where longer sensing time requires more energy. 2) Reporting stage, more cooperative nodes means more CR nodes are reporting to the fusion center and more reporting energy consumed. And 3) the sensing result affects transmission stage. If sensing result is true idle, then the CR node can send, and it consumes energy for transmission, but a good throughput is achieved. However, if the sensing result is false idle, then the node sends, which consumes energy, but with no good throughput since CR transmission interferes with the PU. In this paper, we work on two targets which are reducing the sum of energy consumed in the sensing stages including sensing, reporting, and transmission. The second objective is maximizing energy efficiency which is the ratio of good throughput to the consumed energy. For that objective, we jointly find the sensing time required per CR node and the number of nodes who should perform cooperative sensing. State-of-the-art papers sometimes assume a fixed sensing time and a variable reporting time . Others assumed fixed transmission time and variable sensing and reporting times. In this paper, we assume variable sensing, reporting and transmission times. This is supposed to give better performance since we increase the degrees of freedom. • Different time distribution mechanisms are assumed, in  the transmission time is fixed,while we don’t fix the transmission time. • We propose energy efficiency as an objective function to be maximized by jointly finding the sensing time and number of cooperating CRs who perform spectrum sensing. While the optimization problem in  solves only one parameter which is the number of cognitive users that maximizes the energy efficiency. The rest of the paper is organized as follows: in Section 2 we show some related work. In Section 3, we introduce problem definition and system model. Performance measures and the optimization problem are in Sections 4 and 5 respectively. Simulation results are in Section 6. Finally, we conclude in Section 7. 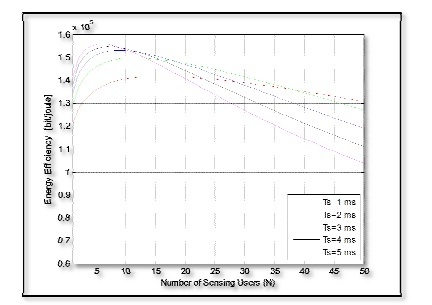 Number of sensing users and the sensing time are significant parameters of the local sensing energy consumption. 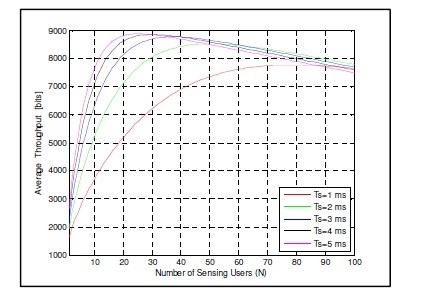 Therefore, decreasing energy consumption in the sensing stage can be achieved in two different techniques, either reducing number of sensing users or by reducing the sensing time. The authors in  formulated the minimum number of sensing CRs that satisfies predefined constraints on detection and false-alarm probabilities. They studied only the energy consumed in sensing stage, and did not consider energy consumed in reporting and data transmission stages. In , the authors reduced sensing energy consumption by dividing the cognitive users into several subsets and only one subset at certain period is activated. The optimal number of sensing users is computed iteratively in  while maximizing energy efficiency. The analysis is based on limited time resources assumption and fixed transmission time. This implies that the time resources dedicated for CSS process are limited and shared between spectrum sensing and results reporting. Optimizing sensing time plays an important factor in the energy consumed in cooperative spectrum sensing. The authors of  investigated sensing time for individual sensing systems. They presented an adaptive sensing time based on the past spectrum occupancy pattern. extra energy consumption in reporting stage, this is because it is repeated twice and also because of the waiting of the first global decision. This will most likely affect energy efficiency. Reporting stage also consumes significant amount of energy out of the energy consumed in the whole sensing process. In 2011,  optimized censoring thresholds to decrease the energy consumption. Censoring is a technique that can reduce the reporting CRs. In this strategy, if a CR lies inside a specific range, it reports its sensing result. Lee and Wolf in  introduced a confidence-voting scheme, where each CR sends its sensing result only if it has a given confidence level which is computed from the history of the local result compared to the final result. All CRs still sense the spectrum, which consumes large amount of energy. In , the authors proposed an alternative approach which is called cluster-based spectrum sensing. It foresees that each group of CRs selects a cluster-head to process its results and to report just one decision on behalf of all of the group members. Also in this case, all users still sense the spectrum. In addition, extra energy is consumed due to the information exchange between the cluster-head and cluster-members. In this paper, we introduce an algorithm to reduce the consumed energy, while keeping the detection accuracy over the desirable bound. We investigate the problem of optimizing the number of sensing users and the sensing time of each CR node for CSS by energy efficiency maximization while satisfying a predefined constraint on the detection probability. We consider a cognitive radio system that consists of a fusion center and NT CRs. The CRs work to detect the activity of a primary user on a given spectrum band, as shown in Figure 1. Each working CR receives the primary signal with signal to noise ratio (SNR). We assume that the distances between the cognitive users are small compared with the distance to the primary transmitter. Therefore, it is assumed that each channel gain has the same variance. Also the average received SNR is the same at each CR . Figure 1. Cooperative spectrum sensing system. Each of the cooperative CRs is supposed to employ an energy detector and measures the received power on the channel during the sensing period. In energy detection, each CR collects energy samples, where the signal observed y(t) by each CR is as in Equation 1. We assume that each CR node is provided with a single transceiver. Therefore, the CR cannot transmit and sense at the same time. Consequently, CR needs periodic spectrum sensing, Figure 2 shows the frame structure. Frame duration (T) is divided into three slots, these are: sensing, reporting and transmission. 1. Sensing slot (Ts): when N CRs sense the spectrum and collect energy samples. At sensing time, none of the NT CRs is allowed to transmit on the same channel because we assume energy detection where any measured energy will be considered as PU signal. Note that N can be ≤ NT. 2. Reporting slot (Tr): after the CRs make local measurements, they forward them to the fusion center. The CRs cannot report at the same time over one channel because the receiver is common. Thus, we consider consecutive reporting based on TDMA scheme, where each user has its own reporting time slot. 3. 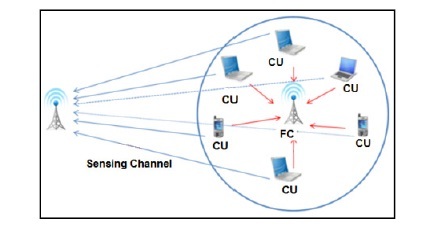 Transmission slot (Tt): if the channel is decided to be unused, one or multiple CRs are scheduled for data transmission. Figure 2. Frame structure for cooperative spectrum sensing in CR. Althunibat, et al  solved an optimization problem based on a limited time resources constraint. More specifically, they assumed that the total frame has a finite and fixed duration. A fixed part of it is dedicated for data transmission, while the rest is distributed between sensing time and reporting time as a function of the number of sensing users. With this finite frame duration assumption, if the number of users increases, the reporting time has to be longer, and thus, a shorter time is left for local sensing. Overall cooperative spectrum sensing performance is evaluated by the detection accuracy of the global decision. A combination of the detection probability and false alarm probability represents the detection accuracy. On the other side, the achievable throughput and total energy consumption represent important metrics in any communication network. The number of sensing CRs and sensing time are significant parameters of local sensing energy consumption. 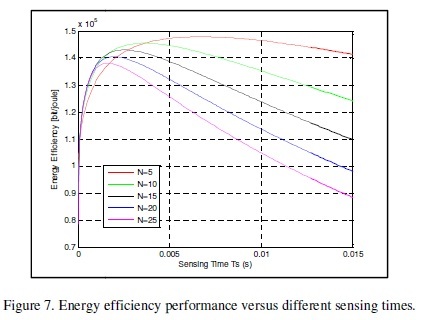 For this reason, improving energy efficiency can be achieved in two different techniques: by reducing the number of sensing users and optimizing the sensing time. 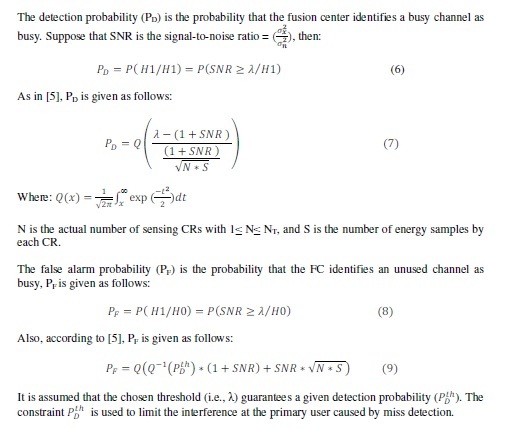 In this section, we propose Joint Optimization Energy Efficient Algorithm to choose the optimal number of sensing CRs and their optimal sensing. We assume that the total frame has a finite and fixed duration while sensing, reporting and transmission times are variable. There is a tradeoff between the selected N and Ts from one side and the consumed energy from the other side. If N increases, PF decreases, as indicated in Equation (9), which increases the energy consumed during transmission, as indicated in Equations (13) and (14), but the good throughput increases also. 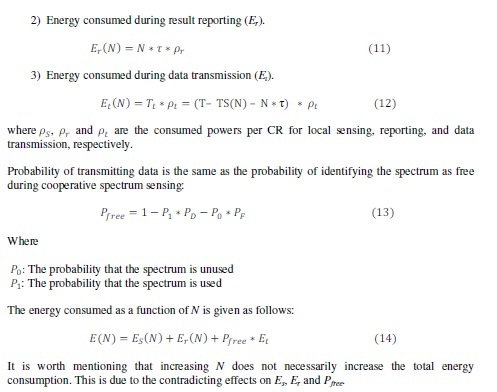 However, larger N implies more reporting energy and less transmission time according to Equations 11 and 12 which decreases good throughput.Also, the same equations indicate that if Ts increases, number of samples increases, PF decreases, which increases the probability of transmitting data and consumed energy during the transmission time, as shown by Equation (12). But also, good throughput increases. However, as Ts decreases, PF decreases, which increases transmission energy without good throughput. Therefore, selected values of N and Ts affect energy consumption. There is also a tradeoff between the selected N and Ts from one side and the achieved throughput from the other side. Increasing the number of sensing users leads to a higher accuracy in the received sensing results, which improves the achievable throughput. On the other hand, larger number of sensing users consumes more time in reporting process. This will decrease room left for transmission and as a result throughput is decreased as indicated in Equation (15). Also, increasing the sensing time for each user leads to increase the number of energy samples which improves the accuracy of sensing results. On the other hand, more energy samples will decrease the transmission time, which decreases throughput, Equation (15). Therefore, it is necessary to select Ts and N so that, the throughput is maximized. We are going to find N and TS which maximize the energy efficiency. To solve this maximization,we will use the bisection algorithm. The procedure of the proposed algorithm is illustrated using the pseudo code shown in Figure 3, where Z refers to the energy efficiency, NOPT is the optimal number of sensing CRs, and Tsopt is the optimal sensing time for these sensing CRs. 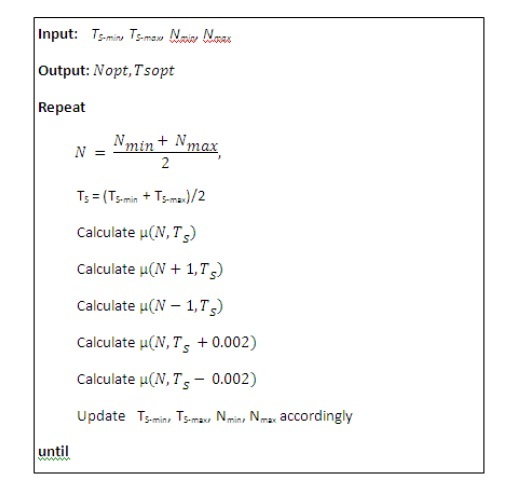 Nmin, Nmax,Ts-min and Tsmax are the boundary values of number of sensing users and sensing time respectively. Figure 6 shows the energy efficiency versus the number values of Ts. 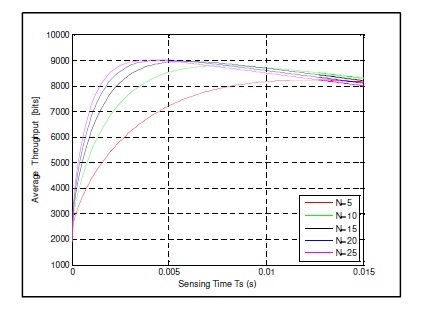 Figure 7 shows the energy efficiency versus the sensing time presented for multiple values of N. Notice that the maximum energy efficiency is achieved at a low value of increases as Ts increases; we can clearly note that there is an number of sensing CRs for each number of available sensing time and the number of energy efficiency. Figure 8. Energy Efficiency versus the number of available users. CR nodes which maximize energy efficiency. Mitola, M. Maguire, Jr. (1 999), Cognitive Radio: Making Software Radios More Personal, IEEE Pcrsonal Communications, Auguat volume pp.13-18. Yucek, T. and Arslan, H. (2009), A Survey of Spectrum Sensing Algorithms for Cognitive Radio Applications. IEEE Communications Surveys & Tutorials, VOL. 11, NO. 1, first quarter, pp.116-130. Maleki, S. Pandharipande, A. and Leus, G. (2011) Energy-Efficient Distributed Spectrum Sensing for Cognitive Sensor Networks. IEEE Sensors Journal, VOL. 11, NO. 3, pp.565 -574. Deng, R. Chen, J. Yuen, C. Cheng, P. and Sun, Y. (2012), Energy-Efficient Cooperative Spectrum Sensing by Optimal Scheduling in Sensor-Aided Cognitive Radio Networks, IEEE Transactions On Vehicular Technology, VOL. 61, NO. 2. Althunibat, S. Renzo, M.D. and GranelliM, F. (2014), Cooperative spectrum sensing for cognitive radio networks under limited time constraints. 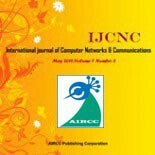 Elsevier Journals, Computer Communications 43, pp.55–63. Su, H. and Zhang, X. (2010),Energy-Efficient Spectrum Sensing for Cognitive Radio Networks, IEEE ICC 2010 Conference. Zhao, Nan, et al. “Energy-efficient cooperative spectrum sensing schemes for cognitive radio networks.” EURASIP Journal on Wireless Communications and Networking 2013.1 (2013): 1-13. Lee, C and Wolf, W. (2008), Multiple access-inspired cooperative spectrum sensing for cognitive radio. ieee communications letters.